Water by Nature Tasmania is collaborating with Rebecca of Wild Yoga to create an enhanced wilderness journey. Ten days paddling along the path of the Franklin River through remote wilderness in South West Tasmania. Soul yearns to feel the rhythm of the river’s song. Living in river consciousness, what will stir in your imagination? The river follows the natural pull of gravity as it flows over, around, and through the quartzite and limestone gorge. What moves you? own life and open to non-ordinary ways of perceiving. Immerse yourself in the presence and wisdom of the river and surrender into the heart of your own particular way of belonging to the world. Enter into a deep love affair with yourself as you float through this ancient and majestic river canyon and root yourself in relationship with the animate, natural world. Discover life-altering glimmers of your greater purpose, unique artistry, and role in the larger Earth community. Rebecca is a river and soul guide, compassionately helping people tune in to the mysteries that live within the wild Earth community, Dreamtime, and their own wild Nature. She gently ushers people to the underground river of their greater story, so they may surrender to their soul’s deepest longing and embrace their sacred gifts. 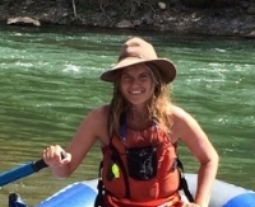 A therapist and wilderness guide since 1997, Rebecca utilizes her training and experience with yoga, meditation, Hakomi, and somatic psychotherapy to support individuals in discovering and manifesting their soul gifts. Rebecca is the creator of Wild Yoga ™, a sacred way of breathing and moving, aligned with Earth and Soul.